When we talk about real estate investing, we mean to ‘buy and hold’ real property. Most commonly referred to ‘buying rental properties’, this is different than ‘flipping houses for quick a buck’. Buying and holding real estate is not a get-rich-quick scheme but requires planning, patience and perseverance. 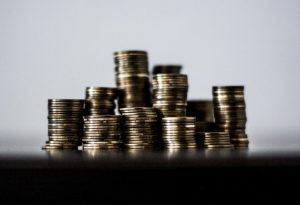 The upside of this type of investing is manyfold: it is safer, provides regular income over longer periods of time and grows your net worth gradually but securely. For this first step, I highly recommend that you speak with a reputable lending institution which specializes in mortgage-lending. Whether a bank, credit union or mortgage broker, each have certain advantages and disadvantages. These institutions will be able to offer advice along with their services, and be able to answer questions about ‘where can the down payment come from’ and other important factors. After you’re secured your finances, it’s time to speak to a REALTOR®. 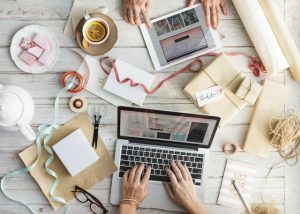 A professional real estate agent will be able to help answer many of the questions you might have, and be able to offer contacts and referrals to some of the other people involved in the process of real estate investing. Make sure you like your agent….you’ll be seeing him/her a lot. Most reputable agents will ask you to sign a ‘Buyers Agreement’, which protects the agent from clients who use his/her service and advice, only to go and make the actual purchase of the home with someone else. Fair is fair: If the buyers agent provides good advice and service thruout the home-buying process, he/she deserved to eventually get paid for their time and expertise. What are your goals? Perhaps you’re just starting out and want to buy one small home in the 200K range to get you started? Or do you want to buy a luxury house, and focus on the luxury rental market? Do you plan to buy one or two homes, or are you looking to expand your portfolio to a dozen or more investment properties? Or perhaps you’re interested in buying an investment condo? Do you want to do this under your name, or are you ready to start a corporation for the sole purpose of real estate investing? Discuss these topics with your agent, and he/she should be able to offer help and advice that will assist you in your decision making process. Before buying a property, having a home inspection done is highly advisable. A $400 inspection can spot major problems, and either prevent you from buying a money pit, or help you get a better deal on the home. Home renovations, such as painting, kitchen and bathroom upgrades, flooring etc are very often needed for these types of properties. The right types of upgrades will also help the investor get a higher rent. 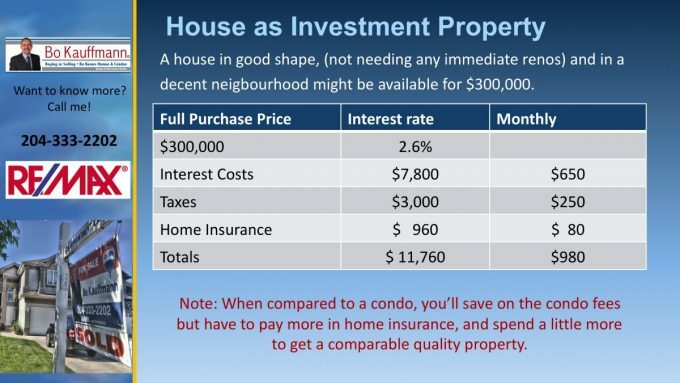 This is really what real estate investing is about: knowing your costs and expenses, and making sure that your monthly rent covers those PLUS more. Remember that unexpected costs, such as repairs and maintenance issues will come up. In condominiums, there could be unexpected special assessments. In houses, the furnace could need maintenances, hot water tanks leak, and faucets drip. Ideally, the successful real estate investor will have a small (but growing) reserve fund to hedge against any unexpected expenses. Put $50-$100 every month into a separate account for such a reason. Know how much a side-by-side in the south end of Winnipeg can command! What kind of rent can you get for a 2 BR condo in downtown? A stand along house in Ft Garry? Probably the best resource for this information will be a reputable property management company, or even a local Renters Guide newspaper, available at convenience stores around the city. Check KIJII to see what other property owners are asking for their homes. Arm yourself with this information before going to look at houses. Now that you know how much rent you can expect, and you’ve selected the areas and price ranges which would fit your needs, go look at some of the available homes on the market. If your real estate agent has done his/her job, and prepared you up to this point, there is no need to see dozens and dozens of homes. This is not a sight-seeing tour! Rent – Expenses = Profit. If you have decided to do this on your own, now is the time to look for a great tenant. Many real estate investors have a lawyer draw up the tenants agreement. Chose the best tenant for your needs. This could mean renting to a family who want to stay there for the long term, or a young couple who only need the place for a year. 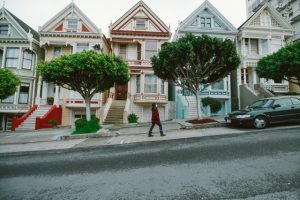 Perhaps a group of students who are only there for 8 months (yes, even this type of tenant comes with its own advantages, if the real estate investor knows how to do that correctly). Buying rental properties in Winnipeg is a great way to grow or expand your investment portfolio. 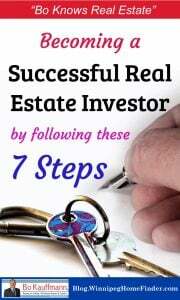 Following the above 7 steps will increase your chances at becoming a successful real estate investor.